Castle Comfort Stairlifts offers top brand stairlifts, keen prices and fast installs for all those seeking stairlifts in Chester, Cheshire. And all work comes with our no-quibble guarantees and famous customer service satisfaction. Give us a call today on 01625 588 6599 - That's our Macclesfield regional office number , however, you are looking for fascinating facts about the area then feel free to read on. Welcome to Chester the county town of Cheshire. Chester with its Cathedral and ‘Rows’. Are you or a loved one lucky enough to call Chester home? If so and if you are not as agile as you used to be, are you considering an aid to help you around your home? Castle Comfort Stair Lifts are just a phone call away and we can help advise you. If you are thinking of getting a stairlift or any other aid, let us help. We can advise you on what is best for you and the home you need to negotiate. Please give us a call on 01625 588 6599. Where is Chester? Well it sits on the banks of the River Dee right on the Welsh border. It is in the west of the county of Cheshire and some 22 miles south west of our last destination, Warrington; 25 miles from our next location of Crewe and just 18 miles from Runcorn. Try before you buy. Cheshire folk are within easy driving distance of our showroom so can visit for riser recliner chairs, adjustable beds and mobility walkers. Chester is Grade I listed! It has so many historic buildings though none of them date back to Chester’s inception as a Roman settlement. The remains of a Roman amphitheatre have been found though and a shrine to the Roman Goddess Minerva remains carved into the wall of a quarry. But Chester is probably better known for its famous black and white timbered Rows. The Rows are found in the four main streets of the centre of the city which were built by the Romans; they are continuous rows of double-storied galleried buildings. The top row is accessed by a covered walkway whilst on the ground level entrance is normal or by going down a few steps. A few of these buildings date back to the 13th century but most are Victorian copies. Some of them – about twenty - still have crypts or undercrofts below the bottom building intact. Chester’s 2 mile city wall is almost intact too – just a small part is missing. The walls have Grade I listing. As the city of Chester was walled, access was by gate. Many of the gates are still in existence though renewed such as Bridgegate rebuilt in the 18th century on the site of the original Roman gate. They now carry the City Wall footpath. We can’t fail to mention Chester Cathedral in this city steeped with history. There may well have been a place of worship on this site during Roman times but definitely since Norman times when the ‘Cathedral’ was built. Actually it was an abbey then and later became a Benedictine Monastery; it was granted the status of Cathedral in the 16th Century. Architectural changes have been made every century making it a real eclectic mix. As late as last century a free standing bell tower was added. Chester Race Course gets a mention too. Unusually it is almost in the city just ten minutes walk from the town hall. It follows the banks of the River Dee and starts off the ‘flat’ season in May with the Cheshire Oaks. The first ever race on this site is recorded as 1539 – even the race course has history in Chester. Not in the running any more even for ‘flat’ racing? Wouldn’t bet on it? Well at least let Castle Comfort Stair Lifts give you a hand with the stairs. We’d gamble on it that you will be more than pleased. Have you watched our founder Keith’s video above? If you haven’t check it out now as it gives you a lot of background information about us. 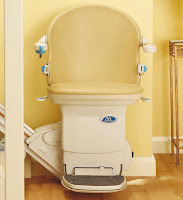 Castle Comfort Stair Lifts also have an office in the area who have all the expertise to advise you about the best type of stairlift for you and your budget. Give us a call on 01625 588 6599 for our suggestions. Who do you know in Chester? The architect responsible for designing Blenheim Palace and Castle Howard, Sir John Vanbrugh was born in Chester. He was also a well known playwright and several of his Restoration Comedy plays have stood the test of time including The Provoked Wife (1697)and The Relapse (1696) are still performed. County namesake Leonard Cheshire was born in Chester; after a notable career in the RAF during WWII, he founded the Leonard Cheshire Charity for the disabled. The new Mr Bond, Daniel Craig was born in Chester; as were actors Basil Radford, Hugh Lloyd, well known for his performances with Tony Hancock and Shakespearean actor Ronald Pickup. Chester also boasts the birthplace of comedian Russ Abbott, singer Lee Latchford-Evans former Steps member. And sports personalities: Beth Tweddle English gymnast lives in the area, champion skater Steven Cousins was born here, as was footballer Ryan Shawcross who plays for Stoke FC – home of Castle Comfort Stair Lifts; Cardiff goalkeeper Tom Heaton too; Fulham FC footballer Danny Murphy; Manchester United’s Michael Owen also claims Chester as his home town; last but not least Helen Willetts the BBC weather girl also comes from Chester. Don’t worry if you are nor longer the physical sports personality you used to be as Castle Comfort Stair Lifts can help. Give us a call on 01625 588 6599 where our local experts will advise you about the stairlifts we supply including part exchange or reconditioned models. And if you need some help funding this necessary purchase, take a look at our grants link or even our ‘0’ percent financial deals. Remember you can use our £50 voucher towards your payments or outright purchase. I'll find out tomorrow Mike.. someone in one of our stairlifts factories will know - our business is full of comedians! That was Ronnie Corbett he needed a stairlift to get to the bar!! A visit to Chester City wall would be all the better if it had a stairlift to get to the top ! Does the price of the stairlift depend on how many steps there are in the staircase, as we have a 15 step run, and from what I have seen they are mainly in 13 steps? I have seen you arrange stairlifts not just in cheshire but in Ireland and Spain. Do you have a good recommendation for a stairlift supplier in Pakistan? Lahore area to be precise. No problem. Acorn Stairlifts have trade dealers in Pakistan. They may not fit as quick as us in Cheshire but at least you know the stairlifts are British made and good ones. Also if you do a Google search for 'stairlifts Pakistan' there are more firms - and English speaking. For some reason our Oxford Stairlifts blog shows up on page one for that search! Let us know how you go on. Re anon's question on the 8th Dec - only *new stairlifts over 4.5 metres, usually about 15/16 steps cost a bit more than shorter ones. We get charged about £50 per metre extra (by the manufacturers over this) as it becomes a track length that may not be in stock and has to be made. And before you ask - much shorter stairlift tracks than the average don't cost less, sadly. *A reconditioned or 'used stairlift' if available, shouldn't cost any more. If you get a stairlift quote for an extra-long recon one and any chairlifts firm tells you it is extra - tell them a firm in Cheshire says 'bunters' - cause the trade wouldn't pay any more for this second hand. Thank you for your kind assistance with our 15 step stairlift problem. Your man was clean and professional and showed us how it all worked. We will recommend you.